Difference Between Cleaning and Disinfecting? Do Dog Disinfectants Need To Be Environment-Friendly? We have listed the most popular veterinary germicides, disinfectant for dog kennels, enzymatic cleaners and bioactive products that will neutralise odours, kill germs and leave the area fresh, clean and sterilised! Following basic rules of hygiene is still the best way to prevent most pests, germs, bacteria and infections. Anybody working in a kennel or dog breeding facility should understand the general principles of cleaning and sanitizing and then learn how to select and use the most effective cleaning products. By keeping a constantly sanitary kennel, you will keep the vet away and build an unbeatable protective barrier against a wide range of enemies that threaten dogs, food, drinking water and buildings. If you own or run a kennel, pet shop, veterinary facility, animal shelter, pet resort, or boarding kennels, you need to read this page! Cleaning is the first step that removes encrusted organic matters such as stains and odours caused by vomit, feces, urine, hair, etc. There are many cleaners out there but for a thorough sanitisation of your dog areas, your will have to also use a kennel disinfectant. Disinfecting is the next step that target germs, viruses, bacterias and other microscopic living organisms, by limiting their development and destroying as many as possible. Both cleaning and disinfecting go hand in hand! It realistically does not need to be environment-friendly but because your dogs will be in contact with these products, you should favour the use of bioactive, enzymatic cleaners over synthetic and pure chemicals. Better and safer for your dogs but also for you and for the surface you are going to use the product on! Less abrasive yet efficient, environment-friendly pet and kennel disinfectants have also seen their price drop over the last few years. 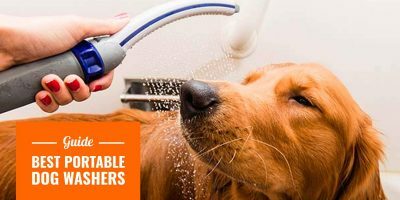 Especially for professionals such as dog breeders who clean their dog areas very regularly, you do want to use products that are as natural as possible. We’ve listed the best natural disinfectant for dog kennels below so you can safely use them daily without putting your dogs at risk. We’ve listed dog breeders’ favourite products for cleaning, odour-controlling and disinfecting their breeding areas. As a bonus, we also offered a nice little preventive solution to avoid make it much easier to sanitise! 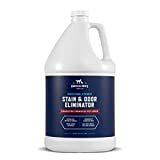 A best-selling bio-enzymatic formula that destroys any stain and odor from urine, feces, vomit, and other organic stains. This product is safe for children and other pets thanks to its environment-friendly formula made in the United States of America. There’s nothing in its active compounds that should harm your wood, stain your plastic or damage your steal. If your dogs are allowed in your home, you will be happy to know that this amazing Pet Stain & Odor Eliminator from Rocco & Roxie Supply Co. managed to receive the Seal of Approval from the trusted Carpet and Rug Institute (CRI) which certifies that it is safe to use it on your carpet, sofa, or else. This is a product used all over the United States and in the United Kingdom by a lot of professionals including dog breeders, kennels and veterinary practices to effectively clean and sanitize cages, surfaces and common areas. The best advantage of this pet disinfectant is that it kills viruses, bacteria, fungi, and cleans, disinfects, and deodorizes in one simple, labor-saving, step. It is a highly concentrated formula that does not need rinsing but can be rinsed if you have very sensitive dogs. 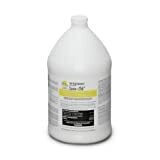 A gallon makes over 250 gallons of sanitizing solution and exists in Cherry, Lemon, Wintergreen and Fresh scents. Many kennels and veterinary clinics rely on the 256 Pet Disinfectant to fight against HIV-1, canine parvovirus, canine distemper, feline picornavirus, staph, salmonella, E. coli, herpes, adenovirus, infectious bovine rhinotracheitis, rabies, bordetella bronchiseptica, pseudorabies, respiratory syncytia, and streptococcus. This powerful disinfectant leaves a pleasant citrus scent and required only few minutes to kill 99% of the major viral, bacterial and fungal pathogens. It is extremely effective against the canine parvovirus and rabies which makes it a must-have for dog breeding facilities. 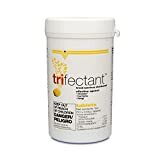 Now available as in tablet form, the Tom Lyn Trifectant Disinfectant has a biodegradable formula and can be used indoors as much as outdoors. Avoid carpets and sofas as some feedbacks mentioned the color changed at the spot the solution was used. Each tablet once diluted gives you a pint of liquid solution, usable in a spray bottle or with a mop. Tablets mean you save a lot of space and can just pop one when you want to start a deep cleaning session, it is very convenient for smaller kennels or dog boarding facilities. Perfect for dog breeders keeping their dogs outside in kennels, this strong product does one thing, and one thing only—it removes kennel odors! It’s cheap, efficient, and simply to use: add a little bit of the Kennel Odor Eliminator to your usual cleaning product and go ahead with your regular cleaning routine. It will attack even the oldest kennel odors in your runs, playpens, cages, floors, etc. The ingredients are non-toxic to pets and humans, and should cause no irritation whatsoever. 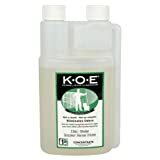 Note than the efficacity of the Kennel Odor Eliminator will diminish if you are using it with a chlorine-based bleach. Many reviews mention that they used it on light-colored carpets without facing any problem. Ideal to fight dog smell, this is not a disinfectant and shouldn’t be used alone for cleaning. If you are a serious long-term full-time dog breeder and breeding dogs is your main activity, you want to invest into an elevated flooring solution that will keep your dogs away from humidity and bacterias. They are also designed to be extremely easy to clean and disinfect so you can save a lot of time and invest it in looking after your dogs more. 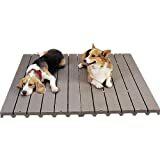 PetEdge Molded Plastic Dog Kennel Deck is a comfortable sanitary flooring surface for dogs that can be used in cages, runs, doghouses or any other area on your premises. It is molded using an easy-to-clean hard plastic material, resisting mildew, mold and disease-carrying bacteria. Another advantage of the PetEdge Dog Kennel Deck is its non-skid, odour repellent surface that is extremely useful and practical when used outdoors in a damp environment and on rough grounds. A dog breeder has written a post on Breeding Business about her daily kennel cleaning routine, check it out and apply the advice she gives. We really hope these products will be useful to you as much as they are to thousands of pet professionals around the world! Eco-88 is an excellent product that absolutely removes pet stains and odors. No harsh chemicals. This is not an enzyme cleaner, but new technology working at the molecular level. Let me know if you would be interested in trying our product. I told myself for two years that I’d get something like this and I finally did and I’m so glad! I travel a few times a year back to my hometown with my dog and had to haul his heavy metal crate. This was FANTASTIC. It’s lightweight. It’s so easy to assemble and disassemble. It took a little coaxing to get him in it, because it was different, but he loved it. The only issue is that I can’t zip or unzip the door panel while it’s fully erect. The zippers stick. But as soon as I release the sides, I can zip it up. My pup is 85 lbs, I got the largest size. He can lay in it comfortably but he doesn’t have a lot of room to move around.